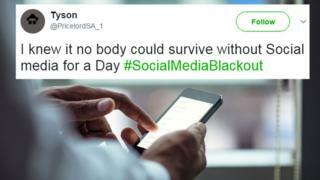 A call for South Africans to boycott social media for a day to protest against high data costs has ironically seen #SocialMediaBlackout trend. Musician and activist Ntsiki Mazwai had urged South Africans to log off and not buy data to pressure mobile providers. Discontent over internet service charges in the country last year led to the #DataMustFall campaign. But it appears that many users could not help but check their social media accounts despite the boycott plea. “Data costs are obscene and are not affordable for people on the ground,” said Ms Mazwai, quoted in Eyewitness News. Internet analyst Arthur Goldstuck told Fin24 that although the campaign had fallen short, “in one respect the trend has highlighted the consumers’ frustration in dealing with the high cost of data”. Amid public anger over the issue, South African President Jacob Zuma at this year’s State of the Union address said “lowering of the cost of data is uppermost in our policies and plans”. Globally, South Africa is mid-ranking when it comes to data prices: Expensive compared with many European countries, cheap though compared with the rest of Africa. In its annual report, the International Telecommunication Union (ITU) ranks South Africa as 85th out of 178 countries for mobile broadband prices, based on 500 MB of pre-paid mobile data. The ITU puts the monthly cost at $7.76 (£6.1), or about 1.37% of personal income. In Niger, the cost is nearly $8 – but that represents almost a quarter of incomes.